When gearing up for a big event such as a trade show, you must consider all of your goals and create a strategy. 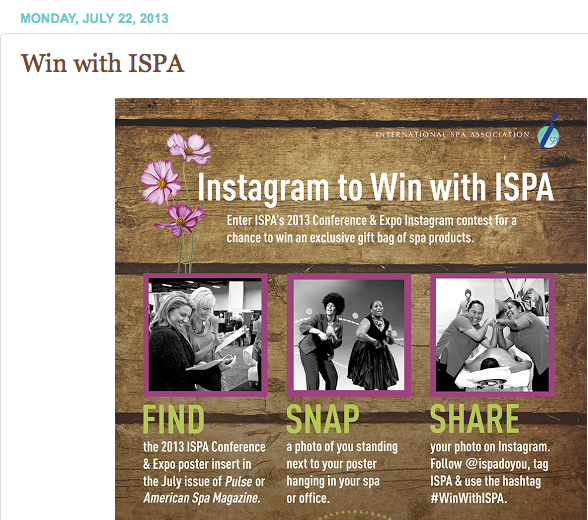 I recently followed all of the online activity by the International Spa Association (ISPA) to see how they prepared before the event, how they interacted during the event, and how they communicated after the event. They consistently used the same two hashtags (below) when sharing anything related to the event. Here, I have included all of the information for the platforms they used for the event. I list sections below showing images of Twitter and Facebook posts. You will see that most of the posts I show are from Twitter but the content on both platforms were pretty much identical. 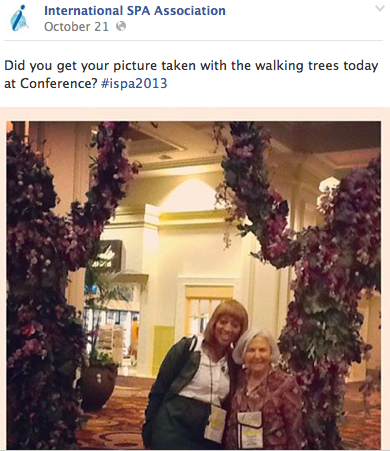 The only difference with content shared on Twitter and Facebook was that ISPA retweeted posts made by others about the event and the Facebook posts showed images in the posts better than on Twitter. The two Twitter handles they used mirror one another as well. 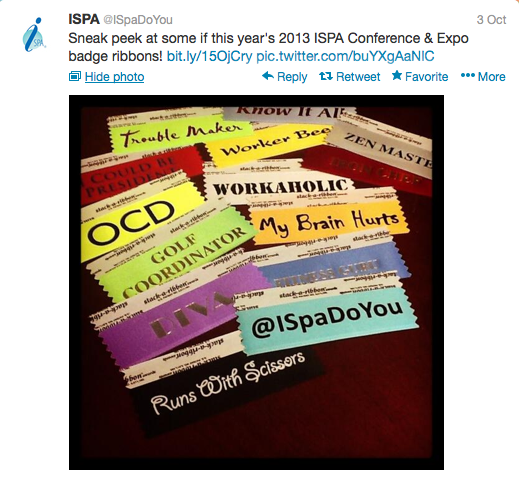 If @ISpaConference happened to tweet something unique, @ISpaDoYou would retweet it. 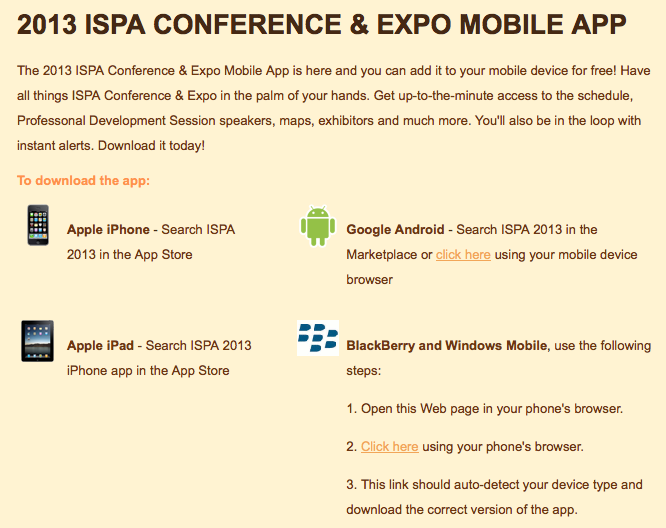 As part of an Integrated Marketing Communication approach, ISPA created a mobile app to help attendees prepare for the event, get information during the event, and promote the event through social networking. Across all platforms, they asked their exhibitors and attendees to share images and messages using the designated hashtags. The website showed the promotional image for the event with dates and location. It also included information from the year prior with details on how to purchase pictures from the event and download the audio recordings. In this section, they also thanked attendees, exhibitors, and sponsors. The same information for the 2013 event should soon replace this area. Through the website, they displayed an Instagram feed with images taken by people at the event. As long as users tagged their images properly, they would appear in the feed on the website in addition to Instagram itself. This is a great way to get people to share the event on their own social networks. 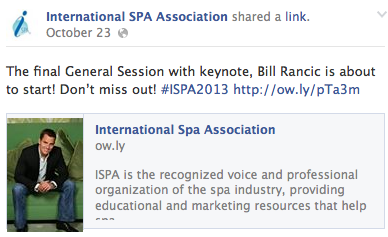 The following were articles that appeared on the ISPA blog leading up to the event. These were all geared towards attendees. They introduced the keynote speakers to get the buzz started in April. The blogs also offered information on the event and encouraged engagement promoting a contest using Instagram. As you can see, this contest was also promoted on their blog. 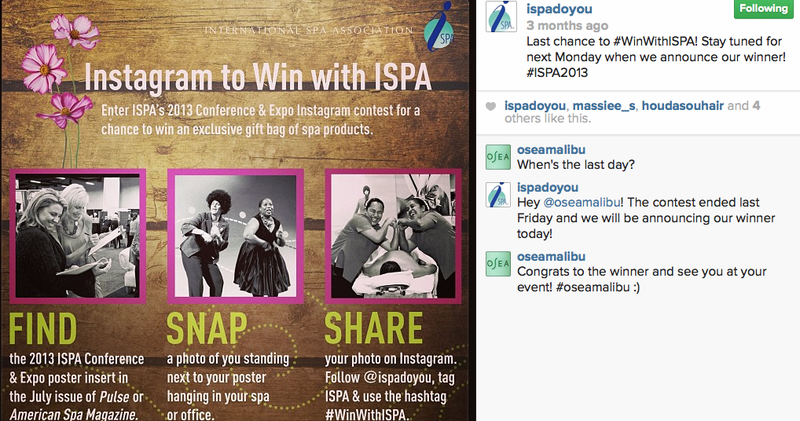 As mentioned above, users were also encouraged to share their event images on Instagram using the designated hashtags. These posts appeared on LinkedIn in April and May to gather exhibitors and auction items for the event. There was also a post from the Chairman with a video discussing industry updates and included mention of upcoming events (YouTube video shown below). All of the Facebook and Twitter posts helped to build the hype and get people exited about the event. They also offered event details and showed attendees how to stay in touch and join the conversation. As you can see in the second to last tweet in this section, the official @ISpaDoYou tweeter was introduced to allow attendees to get to know the person behind the tweets before the event. During the event, Twitter and Facebook posts helped to keep attendees informed of the schedule. They also helped share the excitement of the event to people who weren’t able to attend. At the end of the event, they thanked their speakers and asked attendees to share their “takeaways” from their experience. 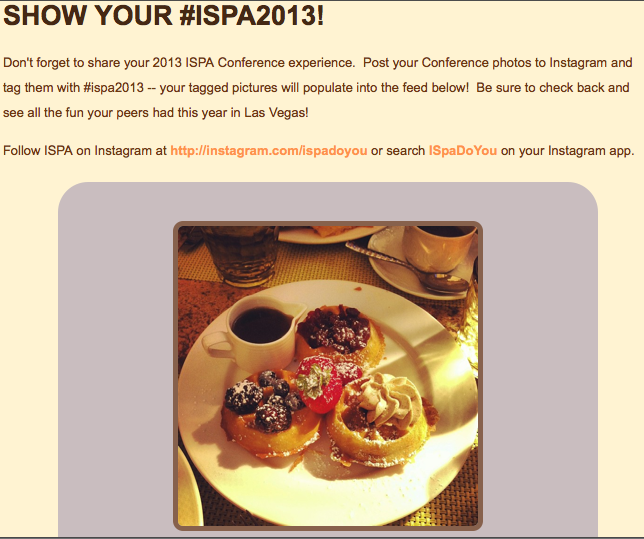 Once the event was over and everyone was heading home, they thanked everyone for coming and asked them to keep the “buzz going” through Instagram, with a reminder that their images would appear on the ISPA website. 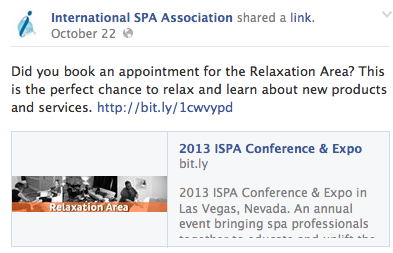 They also asked people to share their experience through email, which would appear on the ISPA blog. 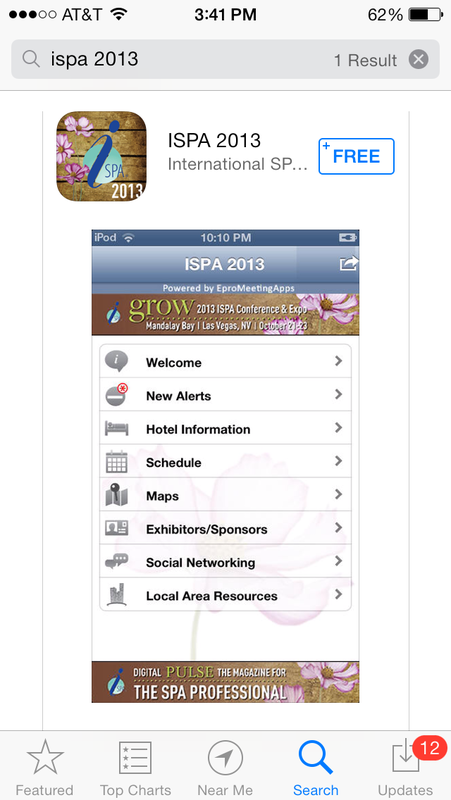 ISPA did a great job promoting their event and creating conversation and excitement. Their actions helped extend the conversation beyond the actual event by utilizing the social media reach of their exhibitors and attendees. I would be interested to see the statistics for next year’s exhibitors and attendees compared to this year.